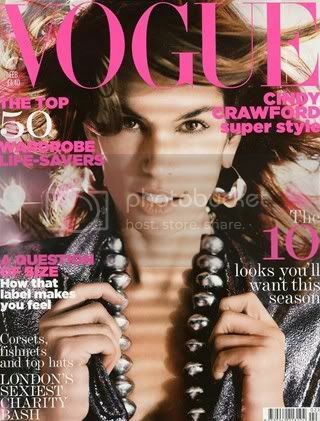 Discussion in 'Vintage Magazines' started by vogue28, Apr 6, 2009. UK Vogue needs more of Nick Knight. The cover shot didn't do her justice, but I remember her body looked great in some of the shots inside, they were quite 'physical'. Nick Knight is great, but I yearn for the day when Vincent Peters regularly shoots a some editorials for the magazine again, his 'dreamscapes' can be captivating, but I suppose Tim Walker has filled that gap with his brand of visual romance. Cindy's editorial was a bit '80s, like a homage to the era, and it had the proper physicality of a model with a more traditional shape, rather than the super-skinny girls we get now. I really like the first and the sixth shot, the rest are a bit ropy. ^Yeah,not the best editorial.I only like the one where she is wearing the white dress. ^the shot in the white dress was definitely the best. Overall the ed is very Dior. I actually love the sort of kitchyness of the editorial! But that cover is no, just no.